PhillyVoice photographer Thom Carroll was one of 8 journalists to get lifted high above the Schuylkill banks on a giant chandelier. It was part of a press event for the 2018 Philadelphia International Festival of the Arts and the world premiere of the performance Cristal Palace. 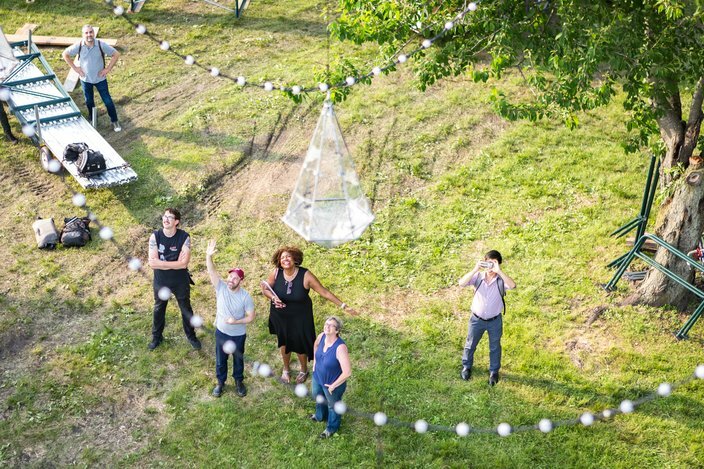 In anticipation of the opening of the 2018 Philadelphia International Festival of the Arts, the Kimmel Center sent eight journalists, including myself, high above the Schuylkill banks on a giant chandelier. 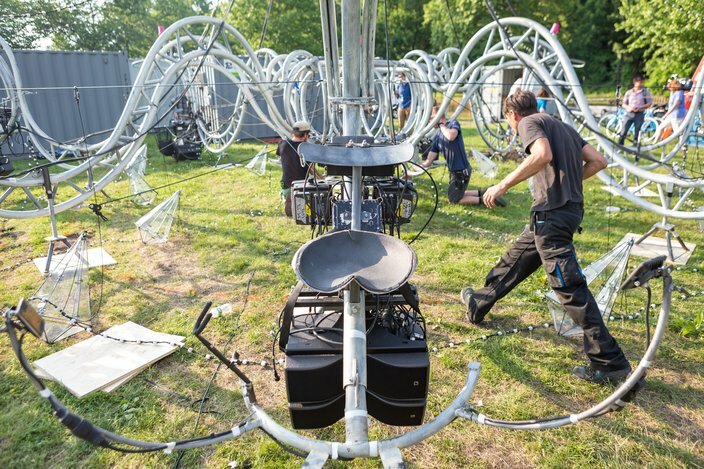 The massive structure is the centerpiece of Cristal Palace, a 360-degree immersive performance by Compagnie Transe Express, a group of musicians, artists and acrobats from France. During the performance, the chandelier will hoist musicians and acrobats high above the crowd surrounded by hundreds of lights and a giant disco ball. The troupe has performed in more than 50 countries around the world and on Broad Street during the 2011 PIFA. They were brought back by the Kimmel Center to create “the best dance party Philly has ever seen.” The performances will be held from Friday, June 1, through Sunday, June 10, near the intersection of Kelly and Fountain Green drives along the banks of the Schuylkill River in Fairmount Park. 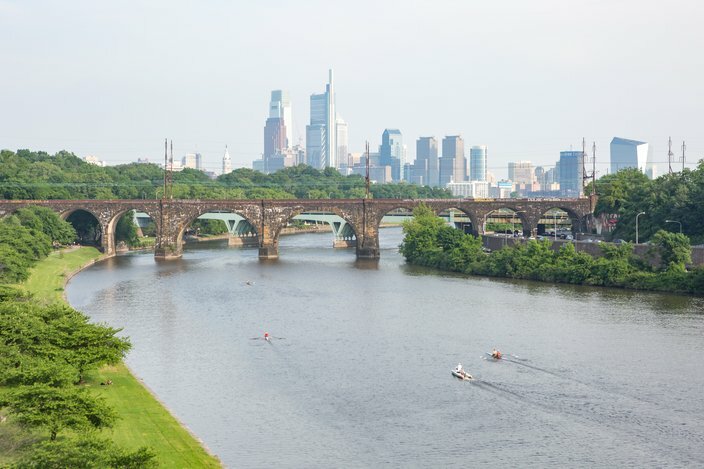 You can watch a video of Jay Wahl, Artistic Director of the Kimmel Center explaining the performance, read more about attending here, and see photos below of the event that sent us soaring above the Schuylkill. 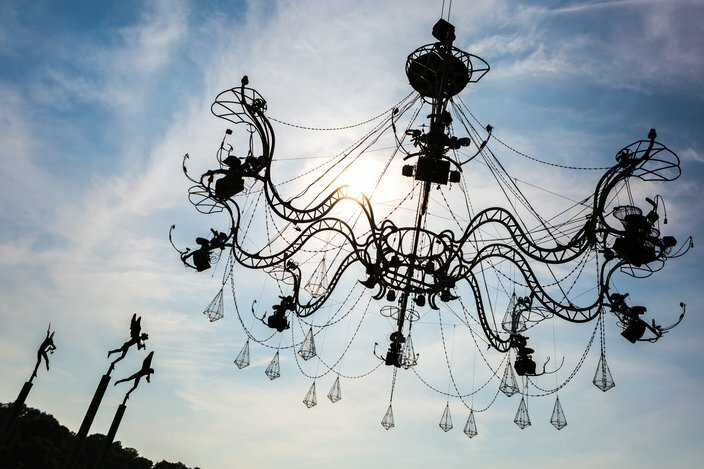 The performance of Cristal Palace features a giant human chandelier created and shipped from France that will fly high above the crowd near the intersection of Kelly and Fountain Green drives. 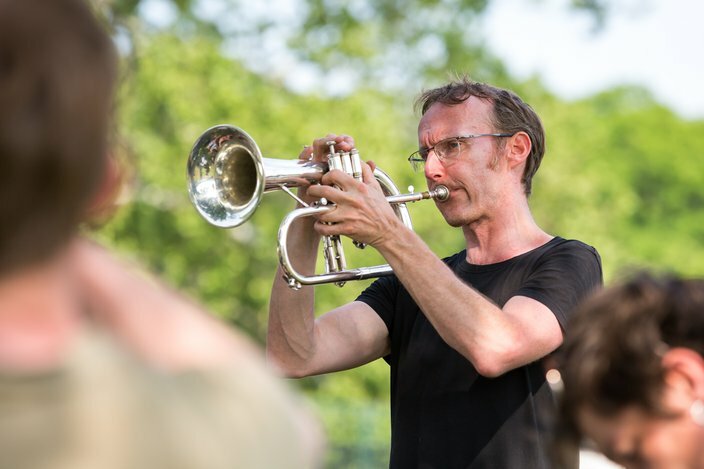 A musician with the French performance troupe Transe Express rehearses under a tree along the banks of the Schuylkill River, Tuesday, May 30, 2018. 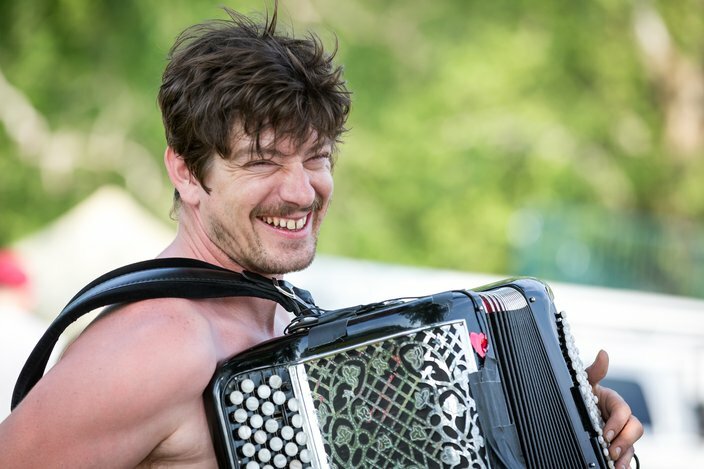 The accordionist jokes as he rehearses with other performers, Tuesday, as the giant chandelier is assembled nearby. 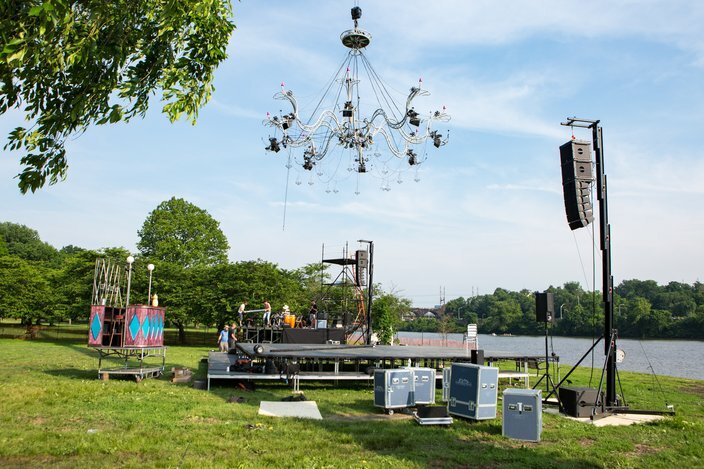 The centerpiece for the performance of Cristal Palace is a giant chandelier that will carry 8 musicians and aerial performers up to100-feet above a stage along the banks the Schuylkill River to create a 360-degree immersive event and dance party. There are 8 arms on the chandelier with lights, speakers and seats for each musician. They are strapped in with a safety belt and a harness acts as a second point of restraint so they don't fall off while rocking out. Part of the crew from the Kimmel Center, including Kimmel Artistic Director Jay Wahl, (waving), look on as the 8 journalists are hoisted above the Schuylkill banks. 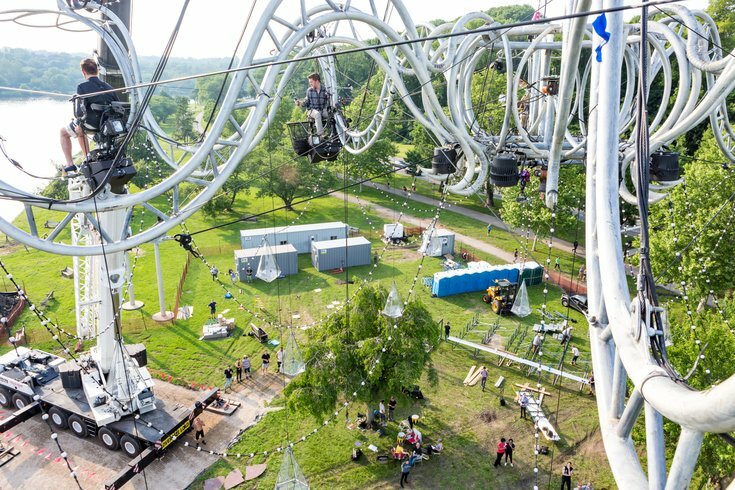 When the performers and musicians are lifted between 50 and 100 feet above the banks of the Schuylkill River, this is most-likely what they will see.